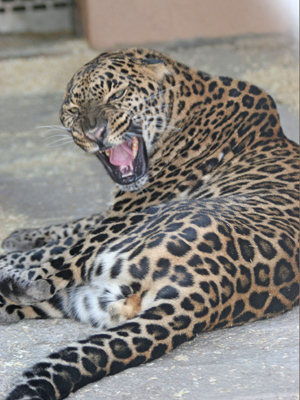 Leonardo is believed to be a jaguar-leopard cross and a magnificent creature. Leonardo was bred for the entertainment industry and was born in a cage. His first two years of life were spent entertaining people in a Las Vegas show. So that he would be “safe” for his handlers and audience, his canine teeth and all his claws were pulled out. No one cared that his teeth gave his jaw support and without them eating would be difficult, or that his mutilated feet would be painful and crippling. No one cared for his welfare at all. 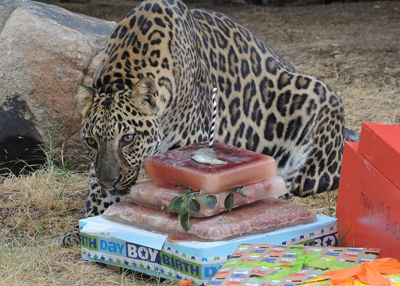 When his owners tired of him, they sold him to a small zoo and pet store in Douglas, Arizona. Leonardo lived more than seven years in a 10 x 12 foot enclosure, nothing more than a curiosity for people. Often, he was teased and neglected. When the zoo fell on hard times, Southwest Wildlife provided a new home for Leonardo. It was impossible to ignore Leonardo’s situation. Southwest brought Leo straight from Douglas to Sonora Veterinary Hospital in Phoenix, where a physical examination revealed one lung collapsed and a severe case of pneumonia, in addition to his mutilated feet from being declawed. We celebrated Leonardo's 15th birthday last year (2017)! With continuing medical care, and lots of love and attention, Leonardo has blossomed. He’s a happy, playful cat these days. 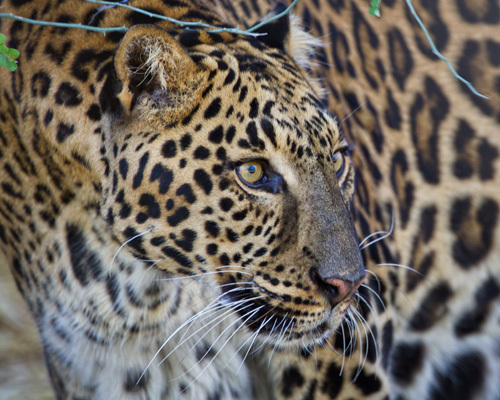 He has a grassy enclosure which is easier on his feet, perches where he can lounge and watch what’s happening at the sanctuary, and piles of toys which he enjoys chasing. Leonardo finally has a safe and comfortable place to call his own. As Leonardo ages, his earlier life of hardship will continue to give him medical problems. Sponsoring Leonardo helps to give him the care he deserves.